Of all the activities we've done so far, choosing a caterer has been the most mutually fun for my fiancé, Kyle, and I (we're big foodies). It also represents a good chunk of our budget- it's coming in at around one third right now). I'm going to share a bit of our thought process for choosing a menu, which extras we think are worth it & a few things we didn't expect when looking for a caterer. Additonally, I'll be sharing my secret weapon for DIY wedding planning, a new site launched by seasoned event planner & friend- The I Do List. 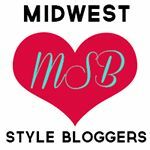 Be sure to check out the rest of the recap of planning our Wisconsin barn nuptials in my La Petite Wedding series. I could see how this could be one of the trickiest decisions for a couple to decide on in the wedding planning process. Thankfully, Kyle and I both have similar taste in food which made choosing a caterer a lot easier than we imagined. We both agreed that food is one of the most memorable aspects as a guest and it was super important that not only was the food delicious but fit with the entire mood of our event. As for the menu, southern barbecue is one of my favorite meals. When trying to land a menu, it was something that we both continued to go back to as an option. We decided that based on the laid back vibe of our wedding we wanted to do a gourmet take on comfort food with a southern style bbq. We'll be having grilled chicken in a whiskey bbq sauce, smoked beef brikset, gouda mac & cheese, cabbage slaw, cornbread & a baked potato bar! Seriously, my mouth is already watering. When choosing a caterer and a menu, think about the food that brings you joy, restaurants you love going to together. Some of the ideas I love are- having your rehearsal dinner at the same restaurant you had your first date, hiring food trucks to stop by for late night cuisine, or a mobile coffee bar if you're both coffee lovers. Sometimes the less elaborate a menu is, the more memorable and delicious it can be. As I mentioned in my first La Petite Wedding series post, we're trying to keep things around $10-$11K for our budget. We originally planned for food to represent around 1/4 of our budget, but it was something that we quickly realized wasn't going to be workable for us based on our needs (i.e. a staff to refill buffet trays). When we reworked things it actualized at about 1/3 of our budget (for 150 guests). We chose a buffet because it was less expensive than a seated meal and a bit more casual. Are there any additional fees besides the per plate fee? travel? warmers for buffet platters? Does the rate include plate rentals? linens? Is there a cake cutting fee? (many vendors charge $1 or more per slice to serve-- which is why we ended up with self-serve cupcakes)? What are you willing to sacrifice to save money- and what's worth it? For us the last question was the most important. 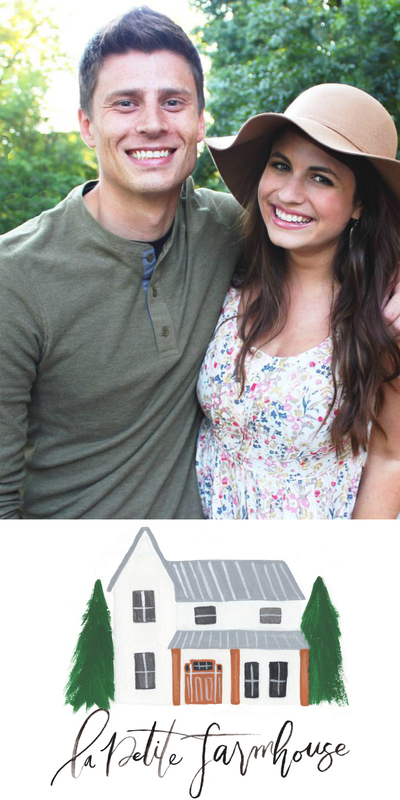 We wanted to make things the least stressful as possible for our families. For example, even though it may be cheaper to rent dishes ourselves- let's be real, our mamas would be the one's helping wash & return them all after the wedding. Striking a balance between convenience and affordability is our priority. The caterer we ended up signing a contract with is from a smaller town outside of Madison and offered a lot of additional extras like a bartender, plates, linens, and more at competitive rates. They created a custom menu for us, met us at our budget and since there's so close to our venue, there was no additional travel fee. All of those little things really add up! Most importantly, the food was delicious. As I mentioned, my friend Sarah, is an incredible event planner. She's collaborated on many photo shoots for La Petite Fashionista magazine and we went to college at Florida State together. She has a ton of experience in the industry and saw that there was a niche and a need for an online resource for wedding planning - which led to the creation of The I Do List. Are there articles you can read & checklists you can download? Yes. But there is nothing that has everything manageable in one place. Planning a wedding can be incredibly stressful, but this gives me major peace of mind to have so much information and insider expertise at my fingertips. Her new website, The I Do List has been the most amazing resource. Especially for a list maker like myself, trying to stay as organized and independent throughout the wedding planning process as possible. I've even had experience planning events, but there are some questions I just had no idea to even ask. The "I Do List" (i.e.). It's an easy to use interface and even stores all of the vendor info you add in to create a wedding day timeline for you, storing all of your key contacts info in it at a glance. 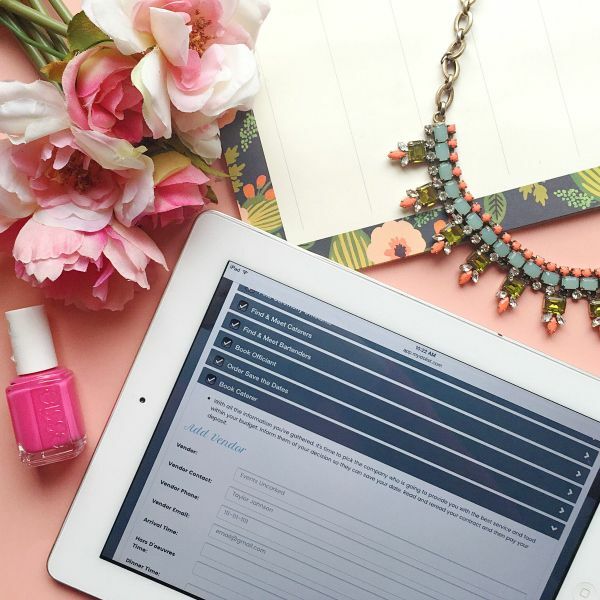 The app creates a digital to-do list you can check off for every stage of your wedding and even includes handy lists of questions to ask each vendor and a place for your to store all of their info once you decide who you're working with. If having a wedding planner is out of your budget, this can be a great way to feel in control of your wedding and equip you with many of the tools that can make planning less stressful. For an additional fee, you can have a wedding planner's one-on-one advice and expertise, which is SO amazing! The I Do List currently offers three tiers, depending on your needs. 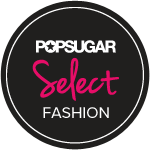 If you use code “lapetitewedding” they will be able to get $200.00 off The Ultimate List option! I'm so overjoyed for Sarah and my fellow brides to be that this resources exists! As I mentioned, I know for a fact that Kyle and I actually saved money when selecting a caterer because we came equipped with the right questions to ask (thanks to the I Do List). What's been your most memorable wedding meal? Browse caterers in your area and make consultations with several before choosing a wedding caterer. 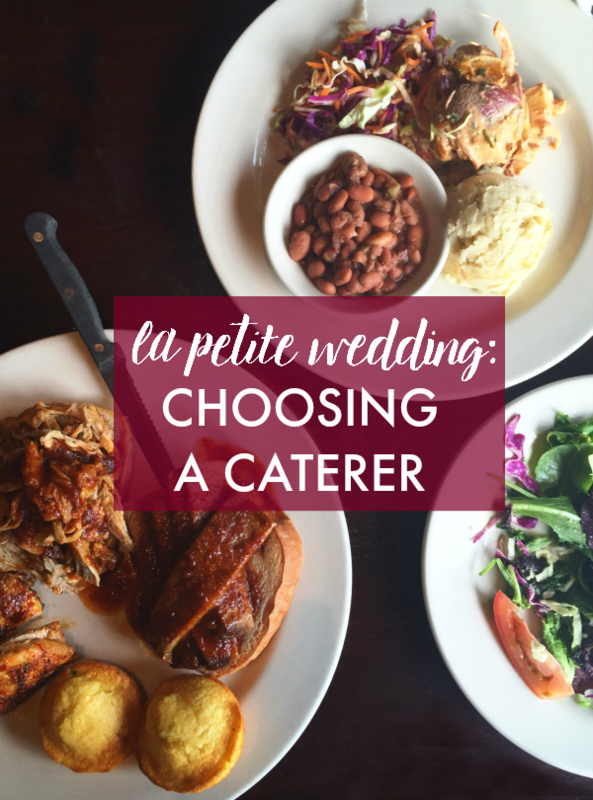 These are some great tips for choosing a caterer. It sounds like you guys have thought of everything. I think you're right to sacrifice a large chunk of the budget for food given that great food can be one of the best parts of a wedding, especially if you and Kyle are big foodies yourselves! I'm sure your wedding will be fantastic and I wish you all the best for the future. Bear in mind that, as well as the catering staff, you may also need someone to open the door and take coats, people to look after the coats, a toastmaster to announce guests and run the proceedings, waiters and waitresses to hand round food and drink, and someone to help with any young guests.